Other Common Names: Hazelwort, wild nard, false coltsfoot, snakeroot, wild ginger, hasselurt (Danish), Haselwurz (German), asaro (Spanish), asaret d’Europe (French). Habitat: Asarabacca is endemic to the deciduous forests of Southern and Central Europe, Siberia, and the Caucasus. 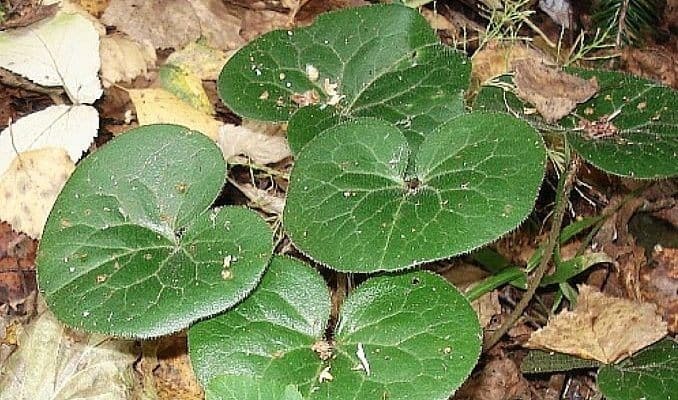 The plant prefers shaded areas and moist humus-rich, calcareous soil. 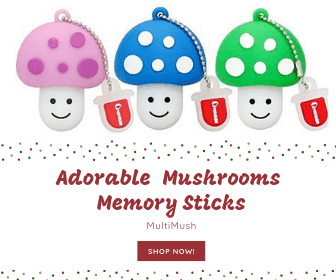 The plant has become popular as an ornamental plant in many parts of the world with temperate climates, as it is an evergreen and can form a beautiful ground cover. Description: Asarabacca belongs to the Aristolochiaceae or the birthwort family. It is a perennial plant that can reach a height to 10-15 cm (4 to 6 inches) tall. It has creeping and branching rhizomes and dark green, shiny 5-10 cm wide leaves. The flowering occurs between May and June. 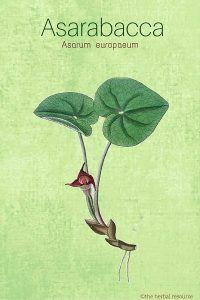 The bell shaped flowers have three broad petals that are reddish-brown. Because the flowers are usually located under the leaves they are often difficult to detect. After flowering, the formation of a round and fleshy seed capsule follows. Plant Parts Used: It is primarily the rootstock that is used as herbal medicine, but the leaves, to some extent, have also been used. The aerial parts or the aboveground parts are usually collected in May to June while the rootstock is harvested in August. All the plant material should be cleaned and air-dried in a shaded place. The dried and powdered herb has a bitter taste. Today, the herb is mostly used as a purified and standardized dry extract in tablet form as the dried herb is quite toxic. The herb is collected mainly from wild-growing plants, but it is also cultivated for commercial use in the United States. Active Ingredient and Substances: The rootstock of the plant contains resin, starch, tannins, flavonoids, aristolochic acid and up to 4% essential oil. The essential oil contains a variety of different substances, mostly asarone (30%), methyleugenol (20%) and bornyl acetate (15%). Asarabacca has a long history as a medicinal herb dating back to the time of the ancient Greeks. In the Middle Ages it was used as a diuretic, laxative and emetic agent. Until ipecacuanha (Cephaëlis Ipecacuanha), a plant from South America also with emetic properties but fewer side effects, was introduced to Europe in the 1600s, asarabacca was the main remedy for food or mushroom poisoning but because of the plant’s toxicity, it probably did more harm than good. In the past, the herb was used as a treatment for rhinitis (irritation and inflammation of the mucous membrane inside the nose), pneumonia, angina pectoris, migraine, liver diseases and jaundice. It was also used as a remedy for dehydration and to induce menstruation and abortion. The dried and pulverized leaves were used as an ingredient in a sneezing powder of sorts to help expel mucus from the respiratory system. Today, the herb is used, in standardized form only, to treat bronchitis, laryngitis, asthma, silicosis, and cough related to smoking. In China and some other countries, plants that contain the same active ingredients (asarone and aristolochic acid) as asarabacca are used in folk medicine. The majority of scientific studies done on plants that contain asarone and aristolochic acid have been directed towards determining the correct therapeutic amount of the aristolochic acid and its pharmacological and toxicological properties. 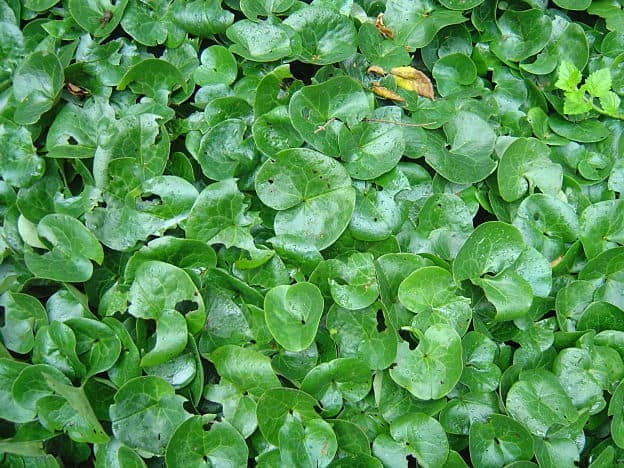 Since the plant grows best in shaded places it is now widely used for ornamental purposes as a ground cover or vegetation in gardens and parks. Asarabacca has also been used as a dye plant and can provide a beautiful apple green color. Under no circumstances, should the herb in its natural form be used for self medication. The plant is dangerous and has been banned for medical application in several countries. When a standardized preparation of the herbs is intended as medicine, a trained and licensed herbalist or other knowledgeable health care provider should be consulted prior to use, both regarding the correct dosage and to see if the herb is suitable. If the plant is consumed it can cause burning in the mouth, heartburn, vomiting, severe abdominal pain, diarrhea, and kidney inflammation. It can cause bleeding in the uterus and may have an abortifacient effect. Asarabacca should never be used by pregnant or nursing women. The essential oil is highly toxic and can cause kidney damage and respiratory system failure. It is corrosive to the mucous membranes and can irritant the skin and can cause blistering. There are mainly two substances found in the herb that are believed to be toxic, asarone and aristolochic acid. Oddly enough, the same substances are also believed to have the most therapeutic properties, so the old saying that the difference between a poison and a cure usually lies in the dosage could be correct. Laboratory experiments made on mice have indicated that asarone may cause liver cancer and that aristolochic acid may cause nephropathy and kidney failure but more studies are needed to confirm this. Nowadays, asarabacca poisoning is very rare but if poisoning is thought to have occurred the first aid treatment should include the intake of activated charcoal and magnesium sulfate, and then seek immediate medical attention. There are no reports that farm animals have been poisoned by asarabacca, which is most likely because they are not keen on the herb’s bitter taste.